The Department congratulates Prof. Songi Han for winning the 2019 Biophysical Society (BPS) Innovation Award. This is a national award that recognizes a BPS member who advances the fundamental understanding of biological systems through the development of novel theory, models, concepts, techniques or applications. 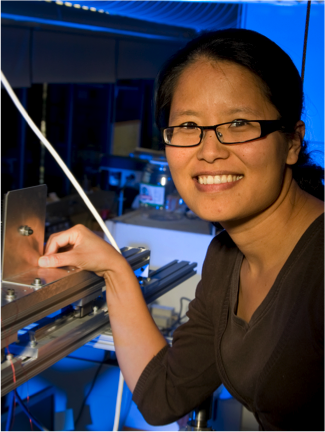 Prof. Han is being recognized for her inventions of solid-state and time-domain-capable dynamic nuclear polarization (DNP) instrumentation and of Overhauser dynamic nuclear polarization to characterize surface water in biological and soft materials. Prof. Han will be presented with her award at the awards ceremony on Tuesday, March 5, 2019, in conjunction with the 2019 Annual BPS Meeting in Baltimore, MD.